Today is the 61st birthday of George Reisch, who recently retired as the brewmaster of Anheuser-Busch. George had worked for A-B since 1979, but his family roots in brewing run far deeper. His great-great-great-grandfather Franz Sales Reisch founded the Reisch Brewing Co. in 1849, in the city of Springfield, Illinois, which operated until 1966. I have had the pleasure of judging at both GABF and the World Beer Cup over the years with George, and he’s an amazing person. Join me wishing George a very happy birthday. 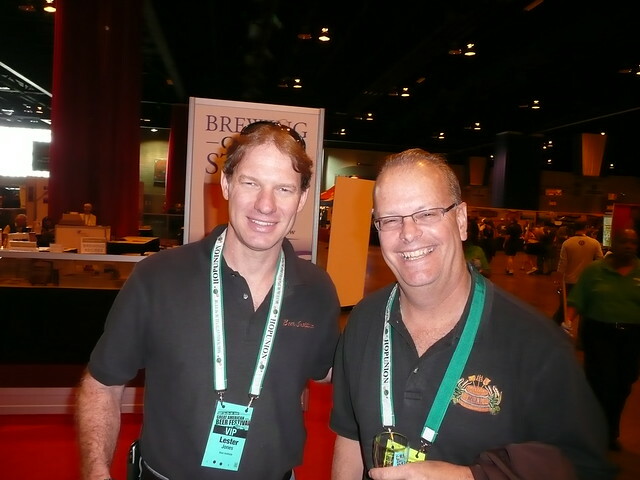 Lester Jones, currently with the NBWA, and George at GABF in 2009. George drinking a beer behind a beautiful skyline and rocking his medal (the one they give you in Belgium when the Brewer’s Guild there knights you).